I am no expert in cooking Asian food, so this year I thought I would give it more of a go. Why have I avoided making Asian food, it is probably due to the numerous times I have tried, purchased all the ingredients, then not knowing what to do with the leftover ingredients I have just thrown them away. How many jars of shrimp paste have I thrown out in the past, where I have only used 1 tablespoon out of the jar. So after a few years of giving it a go, my refrigerator now has a certain number of Asian ingredients I use regularly. I avoid recipes where I will use an ingredient once, then toss out the rest. So I came across this salad in a cookbook of mine, and although it has a large number of ingredients, they are mostly fresh ingredients. The dressing is a simple one, and I can re use the ingredients in other recipes easily. The flavour of this salad is truly amazing. It is so light, refreshing. Me and my husband can't get enough of it. Two out of three of my kids love it to (my 6 year old doesn't as he is currently on a capsicum phobia). What I also love is how easy it is to make, while I get the salad ready, my husband BBQ's the pork. Simple. This recipe I tweaked a bit in the amounts of ingredients used from Julie Goodwin's original recipe. I have doubled the amount of salad leaves (I say doubled, but I do not measure, I just completely fill a large salad bowl with salad leaves), and doubled the quantity of the dressing to compensate. So if you make it and you want less salad leaves, halve the dressing amount also. I only use 1/2 bunch of mint, where she would use 2 bunches. Coriander I use only 1 bunch, but you could easily put in the 2 bunches Julie uses. So you can add or omit things, but for me I love it the way I make it now. Also with the pork fillet. I will give you a guide on cooking times for the pork, but each time we have made it, it has been slightly different, as it depends on the size-thickness of the fillet. So over time, you will determine the cooking times based on your BBQ, and how you like your pork cooked. Heat a tablespoon of the oil in a frying pan (that can go in the oven) over medium heat. Slice the pork fillet in half, so it can fit in the frying pan. Add the pork fillets to the pan and cook, turning every 3 minutes for a total of 12 minutes, browning the fillet all over nicely. Place the pork fillets on a baking paper lined baking tray. Place in your preheated oven. Roasting times are as follows, for thinner fillets 15 minutes, for thicker fillets 17 minutes. Firstly you need to marinade the pork fillet. In a large bowl place the peanut oil, garlic, ginger and chilli. Toss the pork fillet through the marinade mix. Cover and refrigerate for 1 hour. 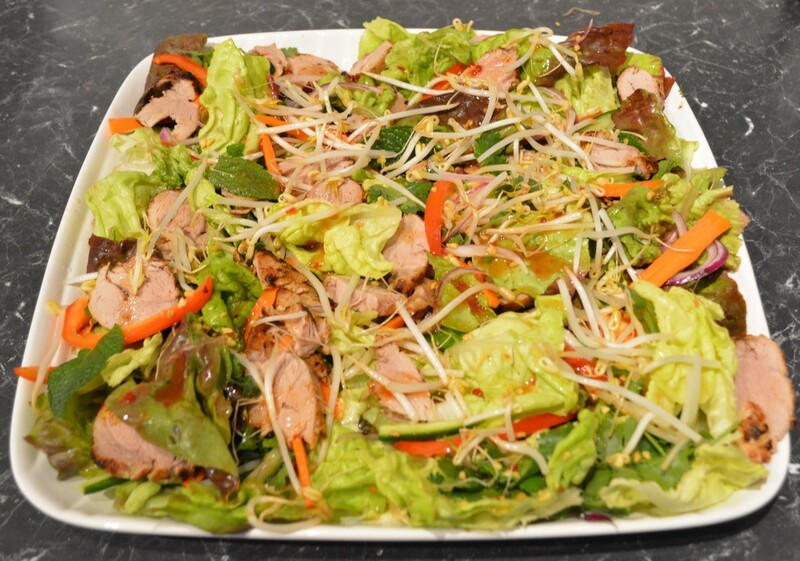 While your pork is marinading start putting your salad together. You will need a large platter or serving bowl for this recipe. Arrange your salad leaves on your serving platter. Scatter over the julienned cucumber, carrot, capsicum, chilli and the sliced onion. Give this a light toss to combine. In a screw top jar add the extra peanut oil, lime juice, sweet chilli sauce and fish sauce. Put on the lid and give it a good shake to combine the dressing ingredients. Now it is time to BBQ the meat. Preheat your BBQ to high. You will need to sear the pork on each side for approximately 4 minutes for pork that is slightly pink in the middle. We usually cook thin fillets for 12 minutes in total, thicker fillets up to 16 minutes, as a guide, turning the meat every 4 minutes. To test if cooked, pierce the thickest part of the fillet, the juices should run clear. Remember that cooking times will vary due the thickness of the fillet. Rest the meat for 5-10 minutes after cooking, cover it loosely with aluminium foil. While your meat is resting, pour over half of your dressing on the salad. Toss to combine. 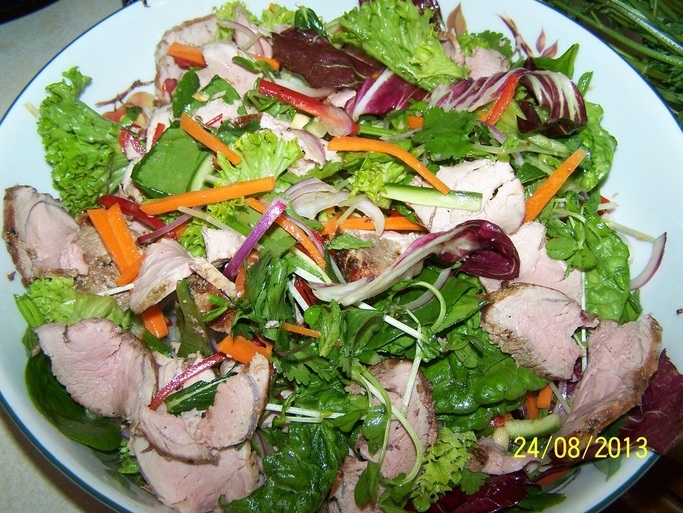 Finely slice your pork and scatter over your salad. Toss gently through the salad. Scatter over the bean sprouts, mint, coriander and peanuts. Pour over the remainder of the dressing, toss lightly. Serve immediately.